My weeklong solo trip to northwest Argentina was a cultural odyssey, a quite different Spanish colonial architecture and more laid back lifestyle than the more hectic, urban pace and European architecture of Buenos Aires. The language and accent remained Argentinian, but there were many differences in food, clothing, architecture, natural diversity of mountains and valleys, music, the cities and provinces of Salta and Jujuy (Hu-hu-y). These differences shaped my time there into a beautiful week and another possible destination to invite American travelers to add to their list of “Places to see in Argentina (with me as your guide, of course). So rich was my week that I will write about each destination in a separate post. 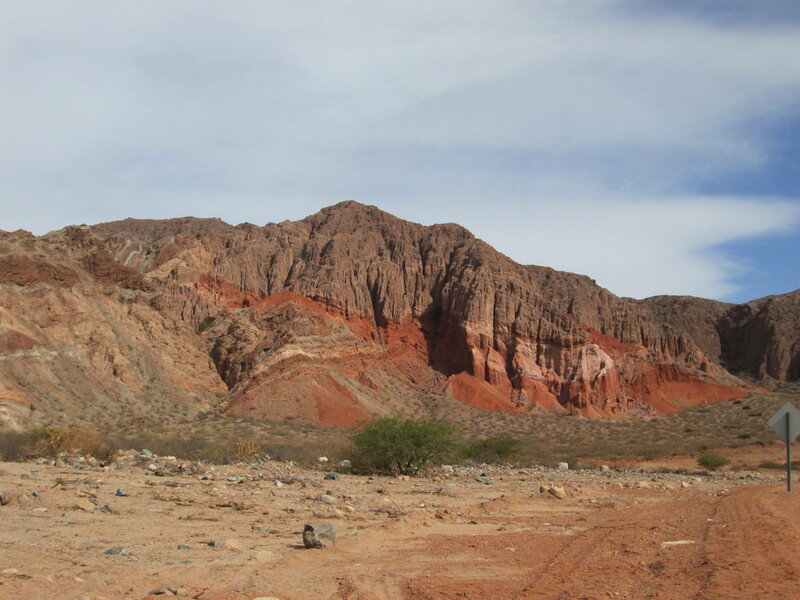 This post focuses on “la vida Salteña” and in the following post I write about my time visiting Jujuy and the towns along the “Quebrada de Humahuaca” (The Humahuaca Ravine). For years I’ve wanted to travel to both places to see these colonial cities and the glorious Andes mountains, valleys and gulches that surround them. My route took me via a 2-1/2 hour airplane ride from Buenos Aires to Salta, where I spent three days/nights roaming and touring the city proper and the fascinating formations of the Quebrada de las Conchas (The Seashell Ravine), an 80 mile stretch of the Andes mountains and gulches best travelled by car (but walkable in places). Along the route our small tour group of 6 stopped to enjoy various rock formations, such as El Anfiteatro, created by the forces of water and erosion over centuries to form a natural “bowl”. Argentine folksinger Mercedes Sosa once gave a concert on this beautiful site with its amazing natural acoustics. The day we stopped a lone musician played his flute and it was as if the heavens were welcoming us to sit and receive this beautiful gift of music he and nature created in partnership. Our midday destination was the city of Cafayate (5,500 ft. above sea level), with its boutique vineyards and wineries, where tastings of the area’s specialty, the white Torrontés wine, are offered daily. Taking a respite from the group I enjoyed a solitary lunch of empanadas Salteñas at La Casa de las Empanadas. Empanadas abound in Argentina, but each province has its distinctive way of preparing them and among the most famous are the varieties of empanadas in the Salta province. They were delicious. Other regional foods I sampled while in Salta and Jujuy included tamales, humitas (made with corn kernels, sautéed onions, spices and goat cheese, wrapped in corn husks), guisos (stews), locro (a special type of meat and vegetable stew commonly eaten during the winter months), and llama (yes, llama the animal!). These are typical regional foods that make up what’s called “la comida andina” (food from the Andes region). Of course this is Argentina, so alongside these regional dishes one could always indulge in parrillas that specialize in grilling meats and, everywhere I travelled, of course, wonderful Malbec wines were inexpensive and delicious! My favorite was llama steak, accompanied by rice and a glass of Malbec, and followed by a dessert of goat cheese, honey and walnuts. Yum! 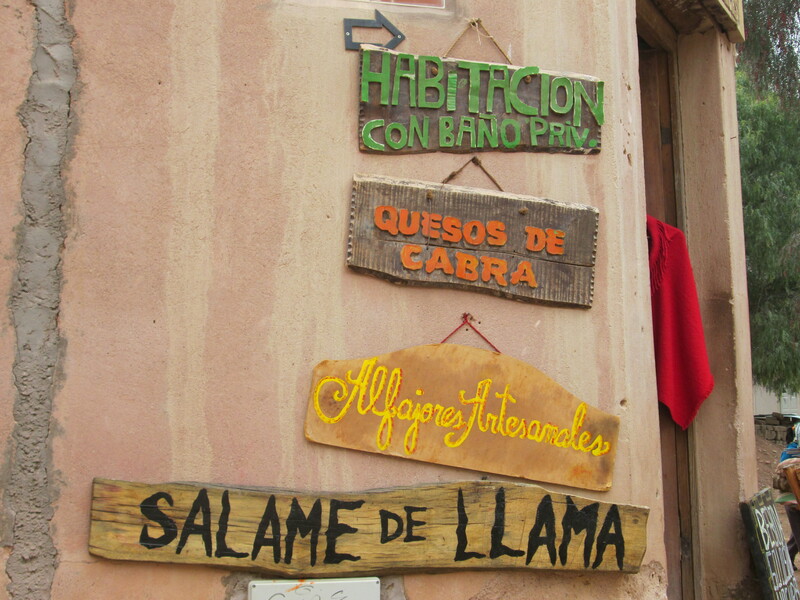 How I wished I had a chance to buy some of the “salame de llama” I saw advertised later during a lunch stop in Purmamarca, Jujuy. But when I returned to enter the shop I learned it was closed so the owner could go see his son play futbol. The city of Salta itself is quite the vacation spot for travelers world-wide.With colonial architecture typical of the 17th and 18th centuries, Salta is known as “Salta La Linda” (Salta the beautiful) and it lived up to its name. An easily walkable city center encapsuled by the Cabildo (government house), Cathedral and an interesting archeological museum, Salta is home to many boutique hotels, like the 5-star hotel Villa Vicuña where I stayed for three nights, three blocks from the center of the city. There I was able to sign up the same day for a delightful 4 hr. tour of the city and surrounding areas. I spent one full day with a group of six others touring the Quebrada de las Conchases itself, a day of beautiful vistas that resemble the southwest US, with its cactus, hills and red rock expanses filling my sights and soul. <I saw goats, sheep, horses, cows, some llamas and their cousins the vicuñas and the alpacas, along the colorful route Hwy 68. The province of Salta in northern Argentina resembles Bolivia, I was told, and people in native dress walked alongside urbanites dressed in the style of the day, some speaking in the original indigenous language called Quechua, and can still be heard in smaller villages and towns. 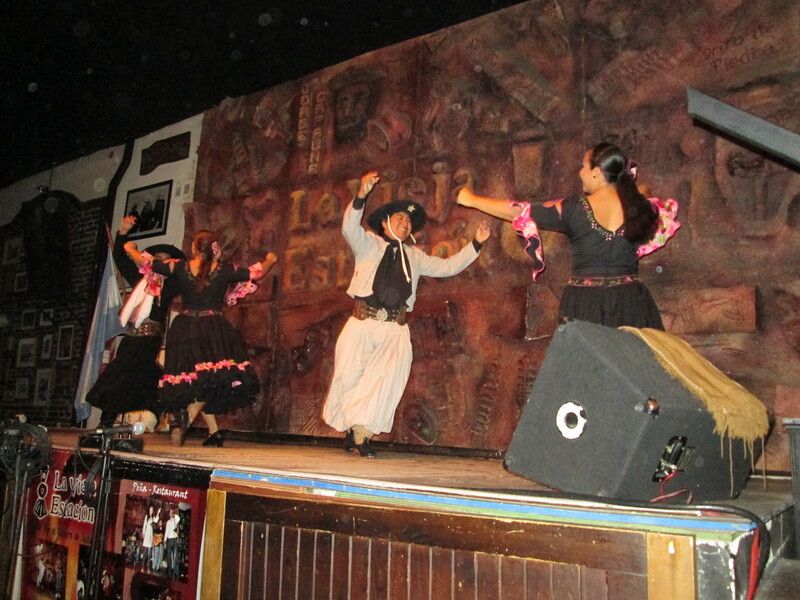 The city of Salta is also home to folkloric music in settings known as “peñas,” with singers and dancers costumed in the gaucho tradition. 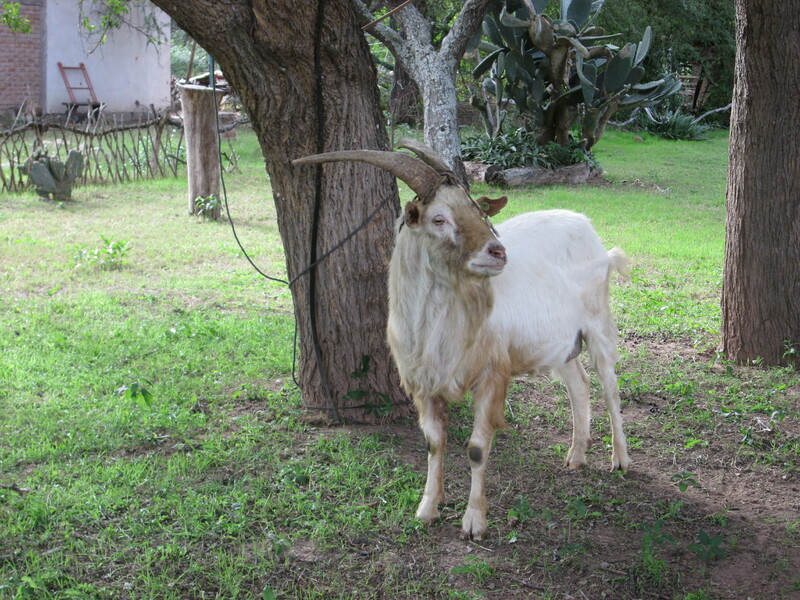 Many “penas” offer a dinner/show combination, where busloads of tourists are welcomed daily. Visiting a peña is a must-do nighttime activity in Salta for tourists and locals alike. If only my nearest companions hadn’t talked throughout the rousing performance I might have enjoyed the peña I visited even more! Oh well, the next day I’d be off to the city/province of Jujuy, and new Argentinian travel adventures. I enjoyed travelling alone, I discovered, although I did miss having someone to share the “moments” of each day, like when I happened upon little children all dressed up, passing out mini-flags to commemorate the Dia de la revolución de Mayo (May 25), or taught one of the others on my tour group how to take pictures with her new ipad. You should work for the Argentinian tourist board. Your descriptions and pictures are very inviting….another reason for coming back! Thanks Kathy! Come back anytime and bring Margie or friends.